J. Crew and White House Black Market expanded their markets to serve brides, and now Anthropologie has done the same: on February 14, they revealed their line of bridal gowns, bridesmaid gowns and bridal accessories. We are in love! The line BHLDN, (pronounced “beholden”, which means “to keep” in Dutch) includes bridal gowns, bridesmaid dresses and bridal accessories. Each of the pieces showcases Anthropologie’s classic femininity and style, yet their gowns seem to appeal to many different bride styles: the knee-length gowns are perfect for a bride looking for a shorter, non-tradition wedding dress that still has a romantic feel, while the sweet eye-lit gown is a must-have for the boheme bride. Chic, sophisticated brides will revel in their gorgeous ruffled one-shoulder gown. The majority of their dresses are only offered up to size 14; however, many of them are styles obviously designed for a slimmer bride. Their bridesmaid dresses, however, are designed for various body types. 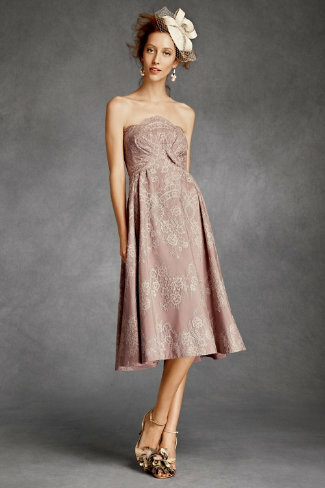 We love this detailed, blush-colored dress which compliments many figures. Perhaps the most unique part of the Anthropologie line is their cover ups: fun boleros and wraps for brides and bridesmaids. They are fun, feminine, and a perfect opportunity to further accessorize on your big day. How fun to be able to say that as a bride, you wore a dress from Anthropologie’s first bridal line. We can’t wait to style a bride who chooses these designs!